Jimmy Morales wins Guatemalan presidential election. Jimmy Morales greets supporters before voting in Mixco, near Guatemala City on Oct. 25, 2015. A brash and controversial TV personality with no experience in government and alarmingly vague policy positions has tapped into widespread frustration with a country’s political establishment to defeat a well-known former first lady to become president. 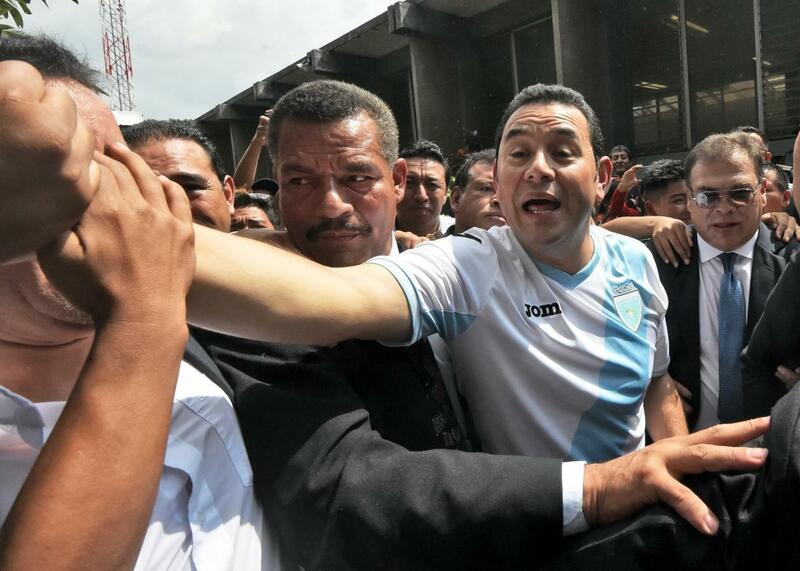 No, this isn’t a U.S. political headline from a year in the future, it’s what happened Sunday in Guatemala, when comedian Jimmy Morales got more than double the votes of former first lady Sandra Torres in a run-off presidential election. The circumstances that led to Morales’ emergence were certainly unusual. On Sept. 2, President Otto Pérez Molina resigned after he was stripped of his presidential immunity and a warrant was issued for his arrest on corruption charges. Pérez Molina stands accused of being involved in a massive bribery ring that allowed companies importing goods into Guatemala to avoid paying customs duties, depriving the country of millions of dollars in revenue. The scandal had provoked months of mass protests before the president finally stepped down. Just a few days after Pérez Molina resigned, Morales came in first in the initial round of the presidential election. Less than half of the country’s population voted in the second round on Sunday, so the big takeaway from the vote is that Guatemalans are fed up with politics and politicians altogether. With no previous record in politics, Morales ran on a clean government platform under the slogan “not corrupt, not a thief.” His opponent in the second round, Torres, was known for running government social programs when her ex-husband Alvaro Colom was president between 2008 and 2012—so, basically, she was doomed by public anger at the political establishment. “I don’t have super powers nor magic and I’ve never said I do, but my heart swells with love for this nation and together we’re going to fight for her,” Morales said at his victory rally last night. He’s backed by a right-wing political party founded by ex-officers from the country’s brutal civil war, some of whom have been implicated in some of the war’s worst abuses, but other than sweeping out corruption and a vague commitment to lowering taxes and limited government, his plans for running Guatemala are pretty unclear. The BBC notes that he’s been criticized for some far-fetched ideas like tagging teachers with a GPS tracker to keep them from skipping classes and giving every child a smartphone. Morales’ TV career makes his ascendancy all the more unlikely. He’s known for playing dim-witted characters along with his brother Sammy, and has been criticized for indulging in homophobia, sexism, and racism, including sometimes appearing in blackface. But the public’s frustration and anger with its government evidently trumped these concerns.